Lecture: "Vija Celmins: In the Studio"
Join us for a lecture on “Vija Celmins: In the Studio,” by MFA walkthrough critic Frances Jacobus-Parker. Frances is a visiting curator at the Snite Museum of Art and a Ph.D. candidate in art history at Princeton University. She is an art historian, critic, and curator who focuses on postwar and contemporary art, with an interest in work by women artists and artists of color. Her dissertation is the first book-length analysis of the pivotal oeuvre of the Latvian-born, American artist Vija Celmins (b. 1938). 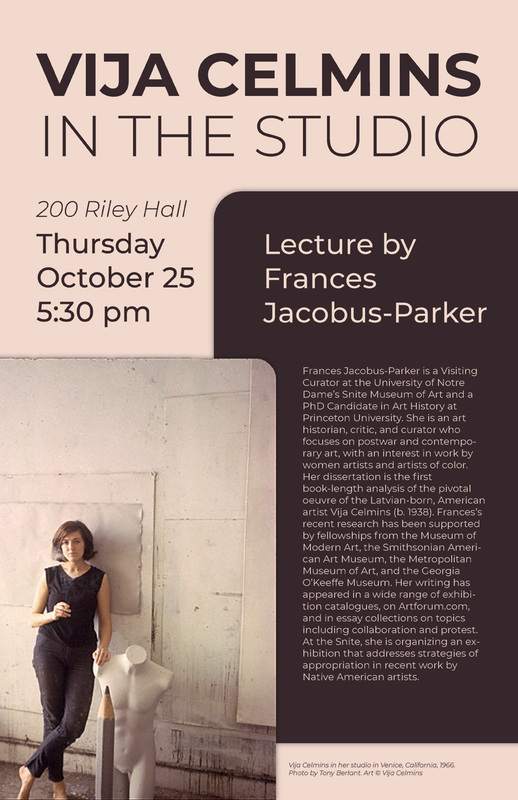 Frances’s recent research has been supported by fellowships from the Museum of Modern Art, the Smithsonian American Art Museum, the Metropolitan Museum of Art, and the Georgia O’Keeffe Museum. Her writing has appeared in a wide range of exhibition catalogs, on Artforum.com, and in essay collections on topics including collaboration and protest. At the Snite, she is organizing an exhibition that addresses strategies of appropriation in recent work by Native American artists.